How the automotive industry could manage and deliver a huge number of assets and information during the process of assembling a car? Which role develop the human resources in those process? Are this elements facilitating or enhancing the value proposition of this companies? First of all, the automotive industry integrates all their efforts through the entire organization independent of the location implementing of Enterprise Resource Planning (ERP: http://bit.ly/1jw8dK7) or Computerized Maintenance Management system (CMMS: http://bit.ly/1TQuCko). 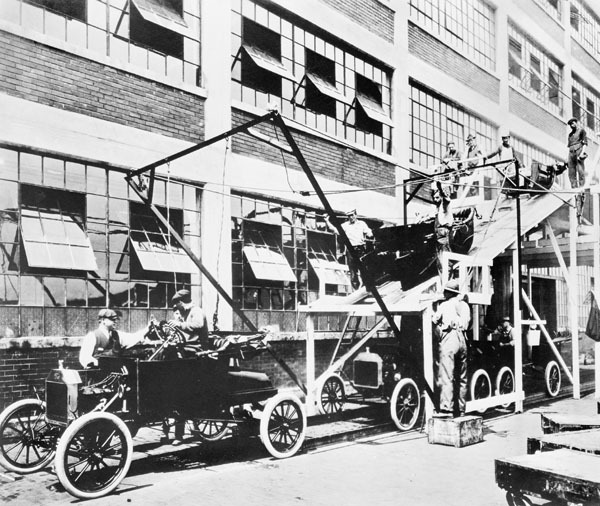 The commonly adopted methodologies in this business sector are: just in time promoted by Toyota and the Fordism introduced by Henry Ford in 1913. 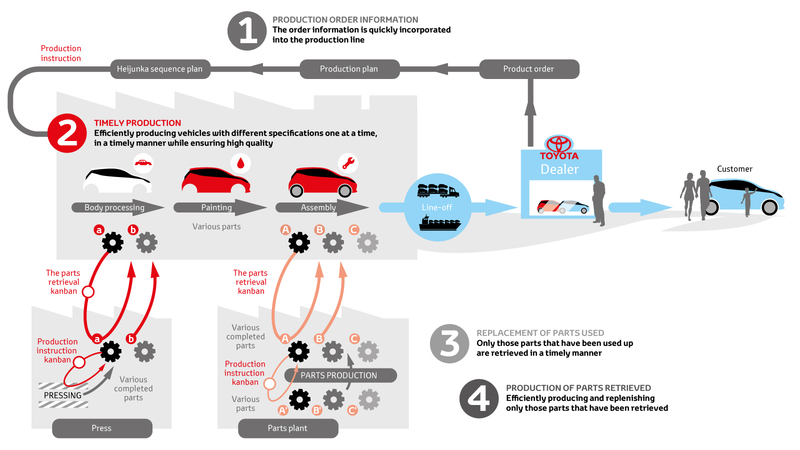 For deepen in these two methodologies of management see Video 1 and Image 1 Ford production system and Video 2 and Image 2 the Toyota production system. Secondly, in order to maximize this flow of management the human resources are the basis of these models. Independently of the computerization of a wide variety of processes and tasks the human resources develop a key role in management and supervision of this processes. For example the machines are programmed and repaired by human resources (at least in a first stage). Table 1. Participative management tools for expand teambuilding and creativity of people. Table 2. Human resources matrix. If we consider logistics at the automotive industry taking in consideration information and human resources these elements are facilitating. Finally, in the present learning object it has been offered an approach to the automotive industry from the perspective of service, sales and logistics. The Cobus Industries GmbH, a german company founded in 1983 in Wiesbaden, is a highly specialized producer of buses used for transportation of people at aiport airfields. Having only 49 employees currently contracted, the company generates 58 million € annual turnover and holds a worlwide market share of around 90% in its niche market. For comparison: The three largest manufacturers of buses in the world are the chinese manufacturers Yutong and Kinglong on the first two places and Daimler on the third position. These big players produced 47. 474, 33. 924 and 32 888 buses in 2012, while Cobus only produced about 400 buses at the same time. Big capacity: A Cobus 3000 can carry up to 112 passengers, while a standard bus of the same size has only a capacity of 50. Cobus buses are not produced in own factories, but by third party manufactures in different regions of the world. By doing so, production can be closer to the target market and maintanance can provide a better and more cost effective service. Since 2011, there is also a electric version of buses available. The first airport that shifted airport transportation completely from fuel consuming buses to electric buses was Schipol Airport in Amsterdam in 2014. We stated previously on our blog that “big data”might be the future in terms of how we do transportation and where the logistic industry is moving. But what is big data? Big data is huge. Big data gathering takes place everywhere: Google, Facebook, Twitter, Instagram, Youtube and many, many more. Almost every action one can take in the internet is being recorded and stored for someone to analyse. And how big is “big data”? IDC says that in 2010 (6 years ago!!! ), the size of digital universe became bigger that a zettabyte (bigger than 1,000,000,000,000,000,000,000bytes). After considering how big “big data” is, we should first draft a strategy on how to implement “big data” into ones business before we become specialized on the logistics parts. First, the business should set clear goals for what big data should be used. It is crucial that Data scientists, analysts and developers work in close collaboration to identify how big data can be used to achieve what. Secondly, it is imperative that data becomes operational from the start, meaning data should be transformed into a usable action plan while being as accurate as possible. Data inaccuracy was and still is today, especially when considering the vast amount of data, a huge problem. Thirdly, having error-free data becoming action,it is time to iterate the process of data management. Iterate the data enriching and refining by adding new data and eliminate unnecessary and inaccurate data from your “data management pipeline”. While looking for trends and patterns within these final data sets, continue this iteration until you can use a vast amount of data and transfer it into an action that add value to your business. How can this data management of big data be put to use for logistics? How will it affect supply chain providers, its solutions and its technologies? Once this process is established, big data can support data warehouse optimization, 360-degree customer analytics, real-time operational production and delivery intelligence and many, many more. However, while many firms have noted the tremendous potential of Big Data for supply chain management, many of them have not yet integrated it into their operations because they lack the financial, technological or human resources to do so. While these are clearly challenges, it is estimated that the digital universe will be over 40 trillion gigabytes by 2020 – a significant portion of that being data that can be leveraged to generate business insights. As time passes, those firms who have integrated Big Data into their supply chains, and both scale and refine that infrastructure will likely have a decisive competitive advantage over those that do not. The aspects that could be improved by the Big Data are the possible benefits for the supply chain management, customized production and service, automatic sourcing, optimized pricing, etc. Although there are countless opportunities to leverage big data, we will focus in this post explaining the real-time delivery tracking, where Big data management systems can be used to strengthen fulfilment, by hardware devices as well as through software for warehousing and processing, the data inputs from bar codes, radio frequency identification (RFID), GPS. Nevertheless many are still the knowledge require into a company to get the maximum profits into the supply chain management throughout the Big Data. A data warehouse system for Hadoop providing a SQL interface but also allowing the plug-in of other custom MapReduce programs. Parallel Processing. Distributing data and business processing across multiple servers simultaneously to reduce data processing times. I find this case interesting and recommend you to read as it tells how Iveco solve the problem to transport to Russia by establishing a partnership with a huge logistics company Kuehne + Nagel, which helps Iveco to enter to the Russian market. Iveco designs, manufactures and markets a wide range of light, medium and heavy commercial vehicles, off-road trucks, city and intercity buses and coaches as well as special vehicles for applications such as fire-fighting, off-road missions, defence and civil protection. The company which is part of the Fiat Industrial Group employs a staff of more than 26 000. It manages production sites in 11 countries throughout Europe, Asia, Africa, Oceania and Latin America, where it manufactures vehicles featuring the latest advanced technologies. 5 000 sales and service outlets in over 160 countries guarantee technical support around the globe. Since 2001, Kuehne + Nagel has been providing various logistics services to Iveco in several countries. On a total of 300 000 square-metres of warehouse space, up to 160 000 stock-keeping units are stored per depot and well over 60 000 tons of incoming and outgoing cargo are handled annually, which result from nine million order lines ranging from small components to entire engine blocks and cabs. With the responsibility to deliver the whole aftermarket, Kuehne + Nagel is distributing the Iveco stock via overnight shipments by its Europe-wide automotive distribution network, utilizing innovative processes such as pick-by-voice technology as well as RFID and Internet-based tracking & tracing of shipments. Here are more commercial video, but it explains what is the company Kuehne + Nagel is about. That video is interesting as it explains the logistics and warehousing system in the european part. Facing an increasing market demand and strong business growth also in Russia, Iveco in 2008 decided to entrust Kuehne + Nagel with warehousing services as well as overland transportation services in this country too. To fully cover the supply of all of Iveco’s service centres throughout Russia, both a suitably located centralized logistics centre and a powerful domestic delivery network was needed. With over 63,000 employees at more than 1000 locations in over 100 countries, the Kuehne + Nagel Group is one of the world’s leading logistics providers. In Russia, where in 1992 it was among the first international companies to establish its own organisation, today a workforce of around 800 people in 17 locations provides a complete range of transport and logistics services and operates facilities with a total warehouse space of more than 131 000 square metres. Kuehne + Nagel’s existing warehouse in Sholokhovo, strategically located near Moscow, turned out to be best-suited for the specific needs of Iveco. In this facility, the logistics company dedicated more than 2 500 square-metres with a total of 16 500 store cells exclusively for the vehicle manufacturer’s spare parts. The storage space includes shelf zones with sections for fragile and outsized items, zones for floor storage of bulky freight (such as cabs, chasses and hoods) as well as a special entresol space with various cells for small parts. The majority of the spare parts are sent from Iveco’s distribution centre in Turin, where daily over 100 articles destined to Russia are handled. Kuehne + Nagel transports these regular shipments with four to five weekly FTL by road via Slovenia, Hungary, Slovakia and Ukraine – a journey which takes an average of 8 days. In case of express orders, this time can be drastically reduced using airfreight mode. On behalf of Iveco, Kuehne + Nagel also takes full care of customs clearance, being particularly experienced in this respect in Russia. Except outsized cargo, which is transported in bulk, Iveco spare parts are typically shipped on pallets which are fully labelled with all necessary information about the shipment. Glass components are most complex to transport and can easily be damaged, which is why Kuehne + Nagel packages and stores these with utmost care. In order to optimize both customs clearance and the subsequent unloading of the trucks, Kuehne + Nagel and Iveco have jointly worked out intelligent and efficient loading schedules. Since 2012, Kuehne + Nagel is also managing the door-to-door distribution of Iveco spare parts throughout Russia. By daily truck departures from the Sholokhovo warehouse, approximately 1500 shipments are annually delivered to over 40 sales and service outlets of Iveco in the country. Based on its long-standing experience as logistics provider to the international automotive industry and its powerful road transportation network, Kuehne + Nagel has helped to increase the efficiency and responsiveness of the supply chain of Iveco’s spare parts division to and throughout Russia. For Iveco, the logistics solution designed by Kuehne + Nagel has been a key leverage to further improve customer satisfaction and parts business profitability in an increasingly competitive aftersales market. Job rotation across workstations during a shift in order to balance the load on workers’ bodies; It was decided that workers could stay at workstation A (mild or moderate strain) for an entire shift but that they should rotate between B (most physically demanding) and C (least physically demanding) to reduce the possibility of injury. All measures were tested in one pilot line with an average age of 47 which then achieved a 7% productivity improvement in one year, equaling the productivity of lines staffed by younger workers. And only a few months later, absenteeism had dropped to 2%, below the plant average. Thus, follow-up projects were implemented in other locations, even in the U.S. So basically, tecnical developments and automation can support elderly employees working in the transportation sector. Warehouses and plants need to be redesigned in the next years e.g. through ergonomic tools to support elderly employees best and keep company’s performance high. To make things more complex, managers in the logistics industry should also consider specific requirements for disabled people and immigrants working in the warehouses and plants and a more and more developing multi-language employee base in their warehouse or plant design. At present there are many car companies with assembly lines. Ford is one of the most famous assembly lines. This assembly line had its beginnings at the beginning of the 20th century, but the technology involved in these processes has changed a lot as can be seen in the video. The sequence of processes and the material flow of these factories must be perfectly synchronized to avoid wasting time and money. When designing an assembly line, you must take into account the number of activities to be performed and the proximity between activities. If you want to minimize the distances traveled to minimize the cost, you can design a matrix that relates the activities and identify if: 1) It is absolutely necessary that two activities are together, 2) Especially needed, 3) Important, 4) Certain importance 5) Indifferent, or 6) Harmful. So in the case of a car assembly line it is important the proximity of the materials used in each activity. To improve the assembly line it is necessary to know the initial times and, once the improvements are implemented, to verify that the changes have reduced the time spent on the activity. There are many tools to study times. You can use the timekeeping (the time should be multiplied by a correction factor, prevent that the timed person sees the timekeeping). It can also be used Methods Time Measurement (MTM) that breaks down the movement in micro movements. Another tool used for large magnitudes is sampling. The improvement of activities is facilitated through the use of process simulation tools. These tools allow you to make changes in the process and see how these changes affect the process. This reduces the costs of testing on the actual process, allows more testing, and reduces the need for pilot plants. My post of today is about one of the world’s leading supply chain management companies, CEVA designs and implements industry leading solutions in both freight management and contract logistics. This company is acting in more than 17 regional clusters around the globe, more the 160 countries. It´s working also in Romania,there the company has approximately 110 employees and operate in 3 site locations across the country. CEVA company dedicates to delivering effective and robust supply chain solutions across a variety of industry sectors, including Automotive, Consumer & Retail, Energy, Healthcare, Industrial and Technology. At CEVA, sustainability is a holistic business approach to create and continuously improve a sustainable company delivering long term value for all our stakeholders: customers, employees, suppliers, investors and the communities in which we operate. The company believes that sustainability is everyone’s job and that a sound corporate sustainability governance framework promotes strong leadership by all their management. Sustainability is the foundation of good management practices, contributing to the long-term success of companies and better risk-adjusted returns for the customers. They know that the commitment to sustainability helps them to serve their customers better, is the foundation of good citizenship and reduces the impact of environmental, social and governance risks to the company. It permeates the way they do business, driving them to innovate and be creative in everything from warehousing operations to transportation, from solution design to procurement policy. WHAT MAKES HUNDREDS OF EMPLOYEES SMILE IN WAREHOUSE?